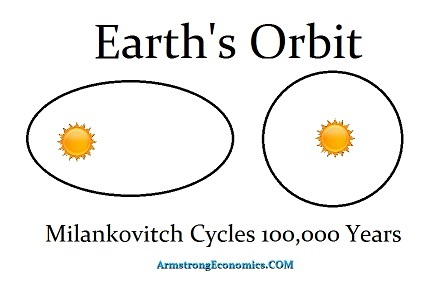 They have recently confirmed that not merely are the Milankovitch Cycles correct, but there is a fractal nature to everything as well as a cycle that sits on top of everything so far. They have determined that there is an approximate 405,000-year cycle in the shape of the Earth’s orbit that shifts from almost perfectly circular to slightly elliptical. There are complex interactions between the planets Venus and Jupiter, which then distort the orbit of the Earth even more. Scientists have been able to trace this back to about 50 million years. Because there are so many variables, it all becomes very difficult to extend their research further back in time. The Precession of the Equinox really works out to be 25,800 years, which is three times 8.6. This frequency comes from something and that is most likely nature. I would bet that instead of a 405,000-year cycle, it is probably 430,000 years. The cycle of the energy output of the Sun has been estimated from ice core samples to be 300 years. That really works out to be 309.6 years. They too confirmed that the flipping of the poles takes place on a cycle between 200,000 and 300,000. That was determined from drilling core samples into rock. The data I was provided for the Mayan Report was from the seabed. That also came up with a little more accurate number of 720,000 years for what appears to be major reversals. There is most likely a build up in intensity that will follow half and quarter cycle intervals. That means there should be some minor shift at the 360,000 and 180,000 intervals. How nature works is extremely complex. There are people who think it can be reduced to human activity. We are not even as significant as a fly on the rear-end of an elephant.